Oasis Food Ministry, food distribution, 4-6 p.m., First Christian Church, 39 Cherry St. Ages 60 or older may come from 10 -11 a.m. Dec. 13. Joy of Christmas Light Show, open 6-9 p.m., Harvey S. Firestone Park, 338 E. Park Ave.; $10 per vehicle or $2 per person; 330-482-2282, tourcolumbianaohio.com. Redeemed Recovery support group, 6:30 p.m., Hanoverton Christian Church, 10251 Plymouth St.; 330-223-1560. Leetonia Community Public Library, Exercise, 11:15 a.m.-12:15 p.m. Crochet, 4-6 p.m. Legos, 4:30-5:30 p.m.
Mystery Book Club, 3 p.m., Lepper Library, pick from author Vannetta Chapman; register at 330-424-3117. Columbiana County Antique Tractor Association, 7 p.m., North Georgetown Fire Hall; 330-310-5413 or 330-814-7245. Salem High School Class of 1954, breakfast, 9 a.m., Adele’s Place. Loyal Christian Benefit Association Branch 654, Christmas party, 6:30 p.m., St. Paul Parish Rectory Meeting Room; bring $5 gas card from Marathon Gas Station for Sophia Center. Salem Bird Study Club., 7 p.m., First Presbyterian Church, 436 E. Second St.; use rear entrance. Township trustees, 6:30 p.m., township hall in Gavers. Winona Area Historical Society, 6:30 p.m., meeting house. Angels for Animals, “Antiques, Jewelry and Holiday Decor Sale” fundraiser, Andrews Hall, 4750 W. South Range Road, 6-8 p.m.; early bird $5 admission, buyers’ choice, wine and appetizer reception; angelsforanimals.org. Crown Theater Productions, “A Christmas Carol,” 8 p.m., Main Street Theater; tickets at crowntheaterproductions.org and 330-482-9915. Stage Left Players, “Christmas at Mamaw Jo’s Stop-n-Go,” 7 p.m., Trinity Playhouse” 234 E. Lincoln Way; $14 for adults, $12 for senior citizens, $10 for students; reservations, 330-831-7249. Salem Historical Society Candlelight Tours; 208 S. Broadway Ave., 6-9 p.m. Quakertown Trolley Christmas Light Tours: 6, 7 and 8 p.m.; reservations at 330-337-6733. “Annie The Musical,” 7:30 p.m., Salem Community Theatre; ticket information and reservations, 330-332-9688. Cookie walk, begins at 10 a.m. until sold out, Calla Community Church, 6482 W. Calla Road; $5 per dozen; 330-533-6007. Angels for Animals, “Antiques, Jewelry and Holiday Decor Sale” fundraiser, Andrews Hall, 4750 W. South Range Road, 10 a.m.-4 p.m.; free admission; angelsforanimals.org. Columbiana High School Class of 1961, 12:30 p.m., Paul’s Cafe. Light Up Damascus events: Cookie walk, Home and Craft Show, lunch counter, Hot Pots and Photo Booth, 9 a.m.-1 p.m., United Methodist Church, 300 Valley Road. 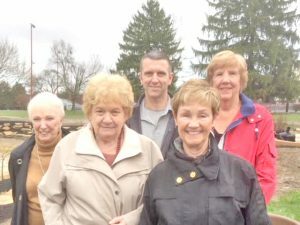 Damascus Community Park Breakfast, 7-10:30 a.m., Damascus Friends Church (lower level) 28857 Walnut St.; eggs, pancakes, local maple syrup, sausage, beverages; $6. Light Up Damascus Community Choir performance, 4:30 p.m., Damascus United Methodist Church, 28857 Walnut St.; directed by Desiree Carrion. United Local Class of 1966, breakfast , 8 a.m., Avalon Restaurant. David Anderson High School Class of 1955, Christmas party, 1 p.m., Clubhouse, 1937 S. Lincoln Ave., Salem. All-you-can-eat community breakfast, 7:30-11 a.m., North Benton Presbyterian Church, 19070 North Benton Road W; $6.50 for adults, $3.50 for ages 6 to 12; carryouts available. Alchemy Acres fundraiser, Christmas tours at Whispering Pines Castle, 11 a.m.-6 p.m., 6295 Adams Road: $10 admission; music by Steve Free and Selfies With Santa, 3-6 p.m.
Haystacks and more breakfast, 7-11 a.m., Eagles Club, 1884 N. Ellsworth Ave.; $6 per meal; auxiliary bake sale, 8-11 a.m.; Band, Roadworks, 9 p.m.-midnight; kitchen open 8-10 p.m.
St. Paul’s Knights of Columbus, Life Ministry and Friendship Circle are hosting a breakfast, bake, craft and soup sale, 8 a.m.-2 p.m., St. Paul School gym (Scullion Hall), 925 E. State St.; pancake, sausage and egg breakfast served from 8 a.m.-noon; donations accepted; vendor table information ($10); call 330-537-4139 or 330-501-7049. Holiday Arts and Crafts show, 9 a.m.-5 p.m., Memorial Building gymnasium, 785 E. State St. Santa will visit with children from 11 a.m.-1 p.m.; food and beverages available for purchase at the concession stand; vendor spot rental, call Scott Sheldon at 330-332-5512. Salem High School Alumni Association will participate in the Salem Second Saturday, “Home for the Holidays” celebration with an open house from 11 a.m.-2 p.m., 330 E. State St.
Salem High School Class of 1959, soup and salad luncheon, noon, home of Gary and Mary Lou Hartzell, 1212 Southridgg Drive; bring an appetizer or dessert. Christmas Craze, noon-4 p.m, Salem Community Center; featuring 15 vendors. “Christmas Trees” show, 1-5 p.m., Charles Burchfield Homestead Museum, 867 E. Fourth St.; admission $3, free for children with an adult. Salem Historical Society Candlelight Tours; 208 S. Broadway Ave., 6-9 p.m.
“Journey to Bethlehem” live nativity, 1-3 p.m., Disciples Christian Church, 565 Boadman-Canfield Road; tours run approximately every 15 minutes; free admission. Angels for Animals, “Antiques, Jewelry and Holiday Decor Sale” fundraiser, Andrews Hall, 4750 W. South Range Road, 11 a.m.-4 p.m.; free admission and bargaining; angelsforanimals.org. Crown Theater Productions, “A Christmas Carol,” 2 p.m., Main Street Theater; tickets at crowntheaterproductions.org and 330-482-9915. Haystack breakfast, 7-10 a.m., American Legion, $5; carryouts available; 330-427-6259. Stage Left Players, “Christmas at Mamaw Jo’s Stop-n-Go,” 2 p.m., Trinity Playhouse” 234 E. Lincoln Way; $14 for adults, $12 for senior citizens, $10 for students; reservations, 330-831-7249. Christmas Festival of Choirs, sponsored by the Lisbon Music Study Club, 7 p.m., New Lisbon Presbyterian Church, 111 E. Chestnut St., with choirs from First Christian, Bethel Presbyterian, Hanoverton-Bethesda Presbyterian and New Lisbon Presbyterian churches and New Lisbon Presbyterian Church Handbell Ringers, Lisbon Village Singers and Lisbon Music Study Club Chorus; freewill offering will be collected for the music club’s scholarship fund. Alchemy Acres fundraiser, Christmas tours at Whispering Pines Castle, 11 a.m.-6 p.m., 6295 Adams Road: $10 admission. “Pet Photos with Santa,” bake sale and pet clinic, noon-5 p.m., Salem Tractor Supply, 2366 E. State St.; 330-332-0635. “Annie The Musical,” 2 p.m., Salem Community Theatre; ticket information and reservations, 330-332-9688. One-on-one computer help, 11 a.m.-1 p.m., Lepper Library. Cord cutting, 6 p.m., looking to get rid of your cable provider but don’t know where to start? Register for both at 330-424-3117. Public Employee Retirees Inc. # 59, lunch, 11:30 a.m., meeting, 1 p.m., Veterans of Foreign Wars; speaker is Kevin Blenn. Salem High School Class of 1960 and friends, Christmas luncheon, noon, Annabell’s Restaurant. R-Weigh weight groups, 1:45 and 6:15 p.m., First Friends Church. Weigh-ins 1-1:30 p.m. and 5-6 p.m.; 330-337-6889; . Ostomy Support Group meeting, 6-7 p.m., Salem Regional Medical Center’s private dining room at the back of the cafeteria on the ground floor; pre-registration, 330-332-7607. Gettin’ Crafty class, making paint brush Santas, 6:30 p.m., Quaker Room, Salem Public Library, registration required at salem.lib.oh.us or 330-332-0042. Legos and Stories, 4 p.m., Greenford Library; build with Legos, listen to stories and more; for the whole family. Narcotics Anonymous meeting, “Hugs Not Drugs,” 7 p.m., First United Methodist Church, 114 E. Washington St.
Salem High School Class of 1948, breakfast, 10 a.m.. Adele’s Place. Crestview Local Board of Education, regular meeting, 7 p.m., high school cafeteria. Goshen High School Class of 1958, lunch, noon, Annabell’s Restaurant. United Local Board of Education, regular meeting, 7:30 p.m., high school library, 8143 state Route 9. Leetonia Community Public Library, Toddler Playgroup, 10-11 a.m.
Leetonia High School Class of 1966, monthly luncheon, 12:30 p.m., Heck’s Restaurant. Advent concert, 7 p.m., Good Hope Lutheran Church, 12030 Market St.; presented by Sue Deutschlander, Rachel Aiken and Christine Habuda; free will offering will be taken. “Chair Yoga with Abi Dalesandro,” owner of Salem Yoga and Mindfulness, 6:30 p.m., Quaker Room, Salem Public Library; registration required at salem.lib.oh.us or 330-332-0042. Salem Historical Society, monthly meeting, 7 p.m., Dale Shaffer Library meeting room, 239 S. Lundy Ave., public invited; Program “Christmas Celebration,” selections from “Annie,” Carol Sing-A-Long by Salem Community Theatre. Blood Drive by the Mahoning Chapter of the American Red Cross, 1-2 p.m., Sebring Library; appointments, 1-800-RED-CROSS (1-800-733-2767) or RedCrossBlood.org. Holiday Beadwork, 4 p.m., Sebring Library; make a holiday bracelet during the festive season; ages 9-12. Free lunch, 12:30-1:30 p.m. for all senior citizens 55 years and older, Winona Friends Family Life Center on Whinnery Road. Kaiser and National, retirees, breakfast, 8:30 a.m., Adele’s Place. Oasis Food Ministry, food distribution, 4-6 p.m., First Christian Church, 39 Cherry St. Ages 60 or older may come from 10 -11 a.m. Sit ‘N Stitch, 2 p.m., Lepper Library; register at 330-424-3117. Columbiana County Democratic Party’s, holiday party, 7 p.m., Veterans of Foreign Wars Post 4111, 210 E. Lincoln Way; bring a coverdish or dessert to share and a new, unwrapped toy. Drive-thru chicken dinner, 3-6 p.m. or until sold out, Calvary United Methodist Church, 12062 South Ave.; reserve dinners at 330-549-2588. Calzone Night, 5:30-7:30 p.m., Eagles Club, 1884 N. Ellsworth Ave. $6 and up; no advance orders. Something Special, 11 a.m., Sebring Library; stories, finger plays and music; children ages 3 to 5 accompanied by an adult. Lego My Library, 4 p.m., Sebring Library; Legos provided; children ages 6 and up. Narcotics Anonymous meeting, “Hugs Not Drugs,” 1 p.m., First United Methodist Church, 114 E. Washington St.
Quakertown Trolley Christmas Light Tours: 6, 7 and 8 p.m.; reservations at 330-337-6733. Eagles Club, membership Christmas party, 7 p.m.; bring a coverdish and wrapped gift. Allegheny Wesleyan College’s Christmas concert, 7 p.m., Salem High School auditorium; free admission. Santa’s Gift Shop, unique holiday shopping, event for children (25-50 cent items and free pictures with Santa) and Christmas rummage sale for adults, 11 a.m.-3 p.m., Columbiana First United Methodist Church, 210 S. Main St.
“Cookies to Go!” cookie walk, 10 a.m.-1 p.m., $5 per dozen; Bunker Hill United Methodist Church, 15096 W. Middletown Road. Eagles Club, Christmas party for children and grandchildren of members, 1-3 p.m. Band, Mike Webb, 8-11 p.m.; kitchen open 7 -9 p.m.
Coloring for Grown-Ups, 11 a.m., Sebring Library; colored pencils and markers provided along with intricate abstract and themed design sheets; for adults and teens. Country music jam, 6-9 p.m., Tri-State Coonhunters Club, 2601 Irish Ridge Road. “Homecoming Christmas Concert” featuring Larry and Patricia Jewett, 10:30 a.m., Salem Bible Methodist Church, 1647 N. Ellsworth Ave.; 812-675-1549 or dtcrosley@msn.com. Salem Public Library will host Dave Byers as guest musician for “A Little Live Music,” 2 p.m., adult reading room on the upper level; no registration required.